Memorial Day is one of the most popular wedding weekends here in Hampton Roads for so many reasons, but one of the biggest is that our region is considered the East Coast epicenter for military activity. 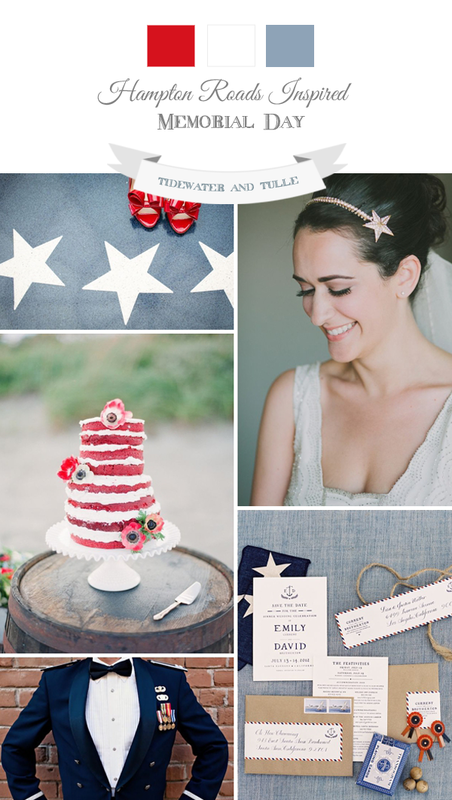 We have a whole ton of ties to Memorial Day; it'd be a shame not to honor it with its own military wedding inspiration board! Using red and white anemones, your florals can add the subtle honor and remembrance of your past loved ones. The anemone is a soft hint and very similar in appearance to the more somber Remembrance Poppy, an American-initiated practice that is a bit more widespread with our UK neighbors across the pond. You don't have to be the star-spangled banner to be patriotic! Speckling stars in various parts throughout your wedding, such as your accessories and stationery, can add that country pride in beautiful ways. Since stars have long been true American symbols representing servicemen and women, ranks, and, of course, our collective fifty states, you can't get much more patriotic than that! While we may partake in barbecues, parades, and ceremonies on this holiday weekend, you can also honor past loved ones through your joyous occasion through these little Memorial Day touches. Looking for more Hampton Roads wedding inspiration? Take a peek through our other local-inspired boards.